The last time the Government of Bahrain reported official demographic statistics on its Sunni and Shi'i communities was in its very first census in 1941, which put the percentage of Shi'a at 53% of the island's population. (See Qubain 1955, who tells that the census was taken "primarily for food control purposes.") In the intervening 70 years, speculation about Bahrain's evolving Sunni-Shi'i balance has become both a local flash-point and a source of frustration for those attempting to study the country. The population of Bahrain is predominantly Shia. Estimates range from as high as 75 percent in the past to about 65 percent at present—but these figures are imprecise. Shiites account for 75 percent of the population -- but for only 14 of the parliament's 40 members. Shiites make up about 70 percent of Bahrain’s population and many retain cultural and family ties with Iran as well as with Shiites in Saudi Arabia. The Farhan family is poor, like many in Sitra and like many of the 70 percent of the country that is Shiite. The opposition says that it is not a sectarian uprising, but a political reform movement, and points to members of the country’s Sunni minority (roughly 35 percent of the population) who support their demands. A long story short, then: no one knows exactly what proportion of Bahrain's population is Shi'i (or Sunni), an ambiguity complicated only further by the government's decade-long program of naturalizing Arab and non-Arab Sunnis for work in the police and military. Once but a rumor, al-tajnis al-siyasi (or "political naturalization," as it is termed by opponents) is today widely-accepted fact. (See the Carnegie Endowment piece referenced above, for example.) Because Bahrain's Sunni-Shi'i balance is not simply a product of nature, therefore, there is no obvious way to estimate it based on, say, natural birth or immigration rates. Fortunately, among the other insights afforded by my 2009 Bahrain mass political survey is a much more accurate estimate of the country's current ethno-religious demographics. So we may now cease quoting the "estimated 65% to 75% Shi'a" figure; for it is wrong. First, I will repeat for the uninitiated what you will learn elsewhere in this blog: that in early 2009 I conducted as part of my dissertation on ethnic conflict and political mobilization in the Arab Gulf the first-ever mass political survey of Bahraini citizens, administering the widely-used Arab Democracy Barometer survey instrument that aims to measure the political attitudes and orientations of ordinary citizens in the Arab world. This same instrument has been administered to date also in Jordan, Morocco, Palestine, Kuwait, Algeria, Yemen, and Lebanon. The survey was conducted based on a nationally-representative sample of 500 Bahraini households, which were interviewed by local field interviewers. (Of the sample of 500, 435 interviews were actually completed; see point #5 below). For more information on the sample, see here. As for the findings regarding Bahrain's Sunni-Shi'i balance, then, we see this below. 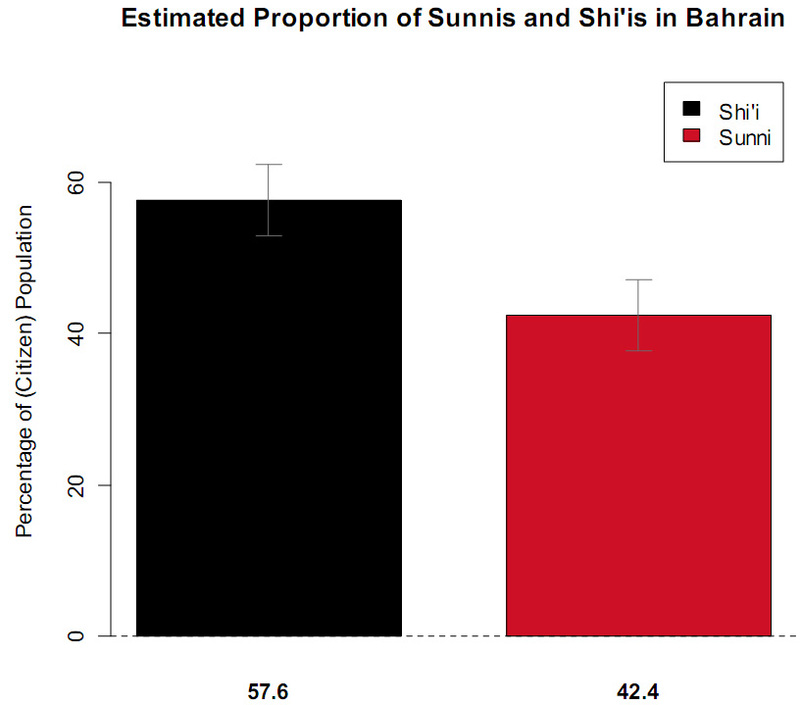 Bahraini Shi'is comprised 58% of my survey sample, Sunnis 42%--a ratio far different from that commonly cited. (Note that these categories do not differentiate between Arab and Persian Shi'a, Hawala, tribal vs. non-tribal Sunnis, and so on.) The estimated sampling error is 0.0238, or about 2.4%. So, the 95% confidence interval for the estimate of the Sunni proportion is approximately 37.7% to 47.0%, or 42.4% ± 1.96 * 2.4%. Correspondingly, the 95% confidence interval for the Shi'a proportion would be 57.6 ± 1.96 * 2.4%, or between 52.9% and 62.3%. The geographical distribution of these surveyed households as well as their confessional affiliation we find below in my confessional map of Bahrain, about which I posted a previous article. 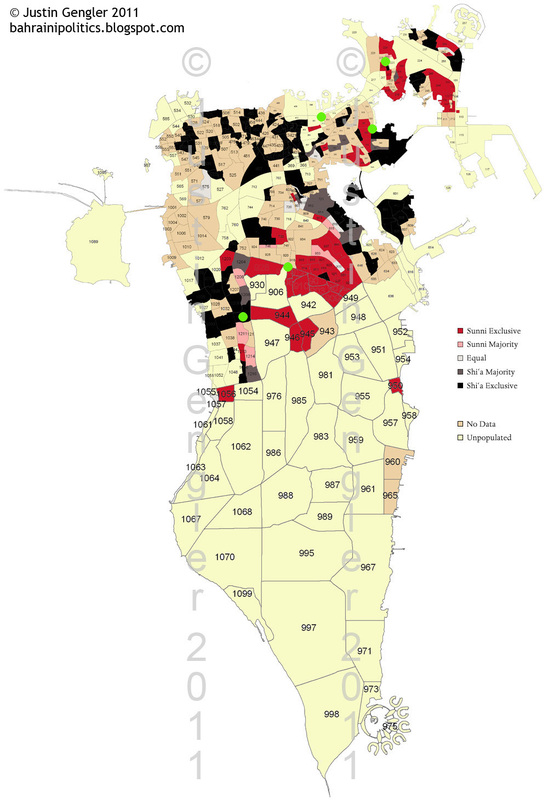 In addition to demonstrating the geographical segregation of Bahrain's two communities, the map also shows the representativeness of the survey sample. (Ignore the green dots; these were added for the previous article.) Finally, for anyone familiar with Bahrain's neighborhoods and cities, it will be obvious that the map evidences the well-known population centers of each group (i.e., al-Muharraq and al-Rifa' for Sunnis; the Sitra peninsula, the villages along al-Budaiyi' Road, and the villages west of Hamad Town for Shi'is), while places that one would expect to be ethnically-mixed ('Isa Town and Hamad Town, for example) are shown to be such. I appreciate that this conclusion that (at least as of early 2009) Shi'is comprise less than 60% of the Bahraini population is likely to be controversial--and, given what it implies, it probably should be--so I will attempt to preempt some of the more obvious questions and criticisms now. Why should we trust your sample? This has already been covered here. The short version: the 500-household sample is nationally-representative, and there is no reason to think it would have been manipulated. If 500 data points seems small, recall that Bahrain is about 3.5 times the size of Washington, D.C., and its citizen population according to the 2010 census is just 568,339. So our population-to-sample ratio is around 1,137:1. To achieve this ratio in the U.S., for example, you would need to interview over 270,000 people. But how do you know if a Bahraini is a Sunni or a Shi'i? You're not even a Bahraini! All interviews were conducted by local fieldworkers, who are more than capable on the basis of location, language/accent (see Clive Holes' work on dialect in Bahrain; or Lee Smith's series in The Weekly Standard), and other cues to determine whether a given respondent is a Sunni or Shi'i. Indeed, as one gathers from the map above, there are but a few places in Bahrain where there can be any question of ethnic membership simply on the basis of location alone. For reasons of sensitivity, however, individuals were not asked directly. If field interviewers were unsure (as happened in several cases with respondents of Persian background), they simply marked ethnicity as unknown. These cases (3 only) are excluded from the proportion reported above. Why does your estimate differ from the standard figure of between 65-75% Shi'a. The most obvious answer we have already alluded to above, namely that this figure fails to account for the high rate of Sunni naturalization of the previous decade or more. But this just can't be right! The end result [of the naturalization program] is some 100,000 [naturalized] citizens in the last 10 years, more than 90% of which are Sunni (in 2001 thousands of second and third generation Bahrainis of Persian Shia origin were naturalized). The effect may have brought the ratio closer to the original 1970 balance of 60-40%. I believe the project is not complete and it is likely naturalization is still taking place at a rate of 10,000 per year. Compare this to Canada and Australia, the two developed economies with the highest naturalization rates, and theirs are around 0.75% for Canada and 0.5% for Australia. And these are countries that have lots of land for people; Bahrain is already too crowded and the land too expensive for anyone to afford, and we’re bringing in even more people." "In September 2007 Sheikh Ali Salman asked what was the population of Bahrain to the Interior Minister, Sheikh Rashid, and his answer indicated that around 60,000 people were naturalized between then and 2001. This is based on the fact that the average population growth rate for the preceding years was around 2.4%; however, the Interior Minister’s figure indicated a jump in the annual growth rate to about 4.2% from 2001 to 2007, meaning there was a 1.8% naturalization rate during these years. This equals out to around 9,000 citizens per year." "The population of Bahrain is predominantly Shia. Estimates range from as high as 75 percent in the past to about 65 percent at present—but these figures are imprecise. The decrease is the result of an extraordinary attempt to change the composition of the population in order to dilute the Shia presence. While the government has never admitted the existence of such a program, there is no doubt that the regime has granted Bahraini citizenship to thousands of Sunni immigrants—estimates vary widely, from about 60,000 people (according to Bahraini human rights sources), to as much as double that figure. What is clear, however, is that many of the new citizens were recruited into the security forces and have become the hated face of the repression." Thus the issue of "political naturalization" is no political bogeyman used by the Shi'a opposition to rally supporters. For one thing, its existence is now common knowledge; for another, it is not just Shi'a who worry about its effects. But you only completed 435 interviews from the 500 household sample. Maybe your figure is skewed. Perhaps, although the remaining interviews are randomly-distributed so there should be minimal influence on the aggregate estimate of the Sunni-Shi'i ratio. That is to say, the 65 remaining interviews we failed to complete because my funding and residence visa in Bahrain were running out, not because we were systematically unable to reach certain respondents. (In fact, looking at the locations of the uncompleted interviews, they are probably more concentrated in Sunni-populated areas than in Shi'i-dominated areas.) Finally, even if we were to say for the sake of argument that, for example, ALL of the remaining interviews were somehow Shi'is, our overall estimate of Bahrain's Shi'a population increases only 5 percentage points to around 63%, which even then is still lower than the typical 65-75% estimate. In sum, there is every reason to believe that the Shi'a of Bahrain today comprise less than 60% of the country's total population. Not only does this estimate represent a vast improvement over current educated guesses reported in media and elsewhere, but it calls attention to the pace and scope of Bahrain's program of politically-motivated naturalization of Sunnis. In the aftermath of the violent crackdown in Bahrain following the arrival of the GCC's "Peninsula Shield" force several weeks ago, media coverage of the continuing conflict there has all but disappeared amid competing crises in Japan, Libya, Syria, and Yemen. This lack of attention has given the false impression that Bahrain's political struggle has somehow run its course, resolving itself through who knows what means. Yet as evidenced by my survey finding here, the crisis has been brewing for no short while in Bahrain, its leaders having long ago taken, as it were, preventative measures in their program of al-tajnis. One should therefore not be lulled by the current lack of press into thinking that it is likely to end soon. Note: to see some preliminary substantive results of the survey, go here. What about mixed sect households? Thanks for your question. This issue arose in only a few cases (2 or 3 if I remember correctly), when a respondent specifically mentioned that his/her parents were of different faiths. In this case, because the respondent already volunteered this information, s/he was asked directly whether s/he followed his/her mother or father. Of course, there may have been cases where a respondent was of a mixed-faith household but did not mention it. In the end, though, since Sunni-Shi'i intermarriage was virtually unknown in Bahrain until the last 30-40 years (see Khuri's "Tribe and State in Bahrain," for example), and our sample included only individuals 18 and older, this issue should only affect a very limited number of cases. To shed light on this matter, we also need to look at the historical perspective. There are historical maps of Bahrain which clearly show the centres of population with the names of towns and villages. Just glancing at such maps, it is clearly evident from the names of the places mentioned that Bahrain has always had a Shia majority. Additionally, should one study the importance of Islam in Arab socities, the number of mosques in Bahrain seems to indicate there were(are?) by far a large number of Shia mosques in most areas to cater for the Shia population than their Sunni counterparts. The populated Sunni areas are also well known historically. Furthermore, I am informed by those who studied in Bahrain's government schools from neighbouring GCC countries in the early 60s that the breakdown in a typical classroom was always one with a clear and not marginal Shia majority. Bahrain has always been known for its Shia character. If we consider natural growth rates and the size of typical families the figure of a Shia majority of 70% seems to be accurate from a historical perspective (based on natural growth rates) without the program of "tajnis". It is evident that “Tajnis” has brought the ratio down (much to the government's liking), but the question is what do you with the existing numbers of Shia that you already have?. Fortunately, Auschwitz cannot be rented. Surprisingly, one often hears from "some" the that late Ayatollah Khomeini had instructed the local Shia population to breed like rabbits and and hence the the explanation why Bahrain has a Shia majority. Amusing analysis to say the least, but then at other times the very same people claim that there there aren’t really many Shia in Bahrain - you could probably count them on your fingertips. Similarly, images of the protest rallies were digitally modified by Iran to show that Shia really do exist in Bahrain. Qaddafi claims that the Libyan people love him and Ahmedinejad claims that Bin Laden probably lives in America. Bahrain is such a small place that it simply cannot afford to absorb such "Tajnis" numbers especially with a young population. The Shia naturally view "Tajnis" was meant to sideline them, on the other hand the government views Bahrain as its back garden! History has shown that not all seeds sown will bear sweet fruit; what’s happening in Bahrain now bears witness to that. Its a short sighted policy on teh government part and a disaster for the future; in no way can the current situation be a cornerstone for the creation of a civil and united society. Thank you for giving me the opportunity to type these few words. I would also like to thank you for your efforts in creating a informative and balanced blog, though some would accuse of being pro-Shia. May I note the Al Wefaq received around 67% of the VOTES in the October 2010 Parliamentary election? Sure. And I'll note that according to my survey only about 66% of respondents said they voted in the previous parliamentary election (in 2006). Since voter turnout is nowhere near 100%, in other words, there's really no way to interpolate general population figures. I believe that I could ive you a good indication of the percentage of Sunnis to Shias in Bahrain. In the last Parliamentary elections in 2010 al-Wefaq, the political society that claims to represent the vast majority of Shias in Bahrain; and is under the spiritual leadership of Ayatollah Isa Qasim, who according to many Shias is the spiritual leader of the vast majority of Shias in Bahrain managed to win 18 seats out of 40 in the Chamber of Deputies. One of the al-Wefaq members won his seat by default, because no one else in the constituency ran for election. In the other 17 seats al-Wefaq received a popular vote of nearly 82,000 votes out of a total of 318,000 who were eligible to vote. A third of the population didn't vote. You can use these figures to have a good educated estimate about the percentage of Sunnis to Shias in Bahrain. You can find the facts on the numbers mentioned above on the following link http://en.wikipedia.org/wiki/Bahraini_parliamentary_election,_2010. Thanks for your comment, Abdulaziz. I am certainly aware of the 2010 electoral results (and actually use them in the discussion of my sample). As I mention above, however, using voting behavior as a proxy for the Sunni-Shi'i population ratio presents many difficulties. First, we cannot know whether Sunnis and Shi'is voted at equal rates. In the Wikipedia article you link, for example, we find a comment that "Shiites felt that they were targeted so they voted intensely for Al-Wefaq despite their restlessness with its performance throughout the past four years." This suggests Shi'a may well have voted at a higher rate than Sunnis, all else equal. Further, because of the way Bahrain's districts are designed, there is very little incentive for individuals to vote on the basis of ethnicity in many districts. Al-Wifaq only ran 18 candidates because it knew it couldn't win any more seats based on how the districts were drawn. So in those districts where there was no al-Wifaq candidate, we can expect voting rates to be lower, all else equal. And likewise for districts that are Shi'a-dominated. In general, the districts with the highest voter turnout are the most highly-contested districts, while others are unlike to elicit as much voter interest. If we would thus use voting trends to estimate Bahrain's Sunni and Shi'i populations, we have no way of knowing how accurate it is precisely because we don't know who it is exactly who is likely to vote. My 500-household sample offers a much more reliable estimate. Thank you for your efforts. It would be interesting to also note the effect of naturalization of thousands of Persian Shiites in Bahrain between 1970 and 1995. That would go a long way to providing balanced reporting. Your efforts are much appreciated however i have a small comment that i would like u to research since you are on the subject. Because my neighborhood (Muharraq) never had such large residents of Shiites till the early 1990s. From my personal experience with them we understand that they are from three scpecific areas in today's Iran. 1. Khorramshahr 2. Abadan 3. Shiraz. I personally do not have any personal figure but i can assure you that they were (naturalized) as you put it. I just wanted to add a little quote, which sadly matches the situation and highlights its absurdity. If your figures are correct, the Shi'a of Bahrain comprise about 27% of the country's total population. According to the 2010 Housing and Population census, Bahrainis represent only about 46% of the total population of Bahrain. Another 46% of the population of Bahrain are Asians - mostly Indians, Pakistanis, Sri Lankans, Bangladeshis, Nepalese and Filipinos. Members of this population often own property and businesses in Bahrain and, above all, form the backbone of the country's working population. Some stay for a few years then return to their home country. Others do not. There are some communities that have been in Bahrain for several generations. Perhaps the political scientists could devise some form of democracy that would give these people a say in the running of the country that they often regard as home. Right, sorry. I meant "less than 60% of the country's citizen population." I used to live near Gudaibiyyah and currently reside in Doha, so I am certainly aware of the non-nationals in Bahrain and in the Gulf! Would be very interested in your thoughts, do you think it's credible? 49% seems very convenient, though I'd have no basis to speculate on its accuracy. All I can say is what my own results indicate, summarized in the article above. One of the problems with such figures in general, though, is that Bahrain's actual naturalization process takes a rather long time (10 years of residence for an Arab and 15 for a non-Arab, I believe), so depending whether one includes these soon-to-be-naturalized people or only full-fledged citizens will make a big impact on the aggregate ratio. Uh the hubris of a novis! A PhD student has finally solved what has escaped all us the old timer scholars so far! So all you out there can stop speculating since "Fortunately, among the other insights afforded by my 2009 Bahrain mass political survey is a much more accurate estimate of the country's current ethno-religious demographics. So we may now cease quoting the "estimated 65% to 75% Shi'a" figure; for it is wrong." What a wonderful arrogance. Or is it the old propaganda machine finding a suitably fellowshipped student to produce "scientific" evidence to prove the AgitProp right? "Mass survey"?? You count 480 household that are made readily available to you by the Bahraini government for your "scientific" proof that Shias are so few and the Sunnis so many in the island nation in the "Arabian" Gulf, and you tell the world to believe your Eureka call? No wonder your findings are all over the Bahraini Government media and Internet propaganda blogs--like this one. Such boldness from an anonymous commentator. You really showed me, what with all the quotation marks and (mis-)quoting of my own words. In any case, if the "old timer scholars" would prefer to base their demographic estimates about Bahrain on 60-year extrapolations of birth rates and (more often) pure conjecture, arriving in the process at wildly divergent estimates (as quoted in the text above), then I am not ashamed to say that I would much prefer an estimate based on a random sample of 200 Bahraini households, to say nothing of 480. Kudos on your effort to use this sample data. I have a few issues with your calculation methodology. "As for the findings regarding Bahrain's Sunni-Shi'i balance, then, we see this below. 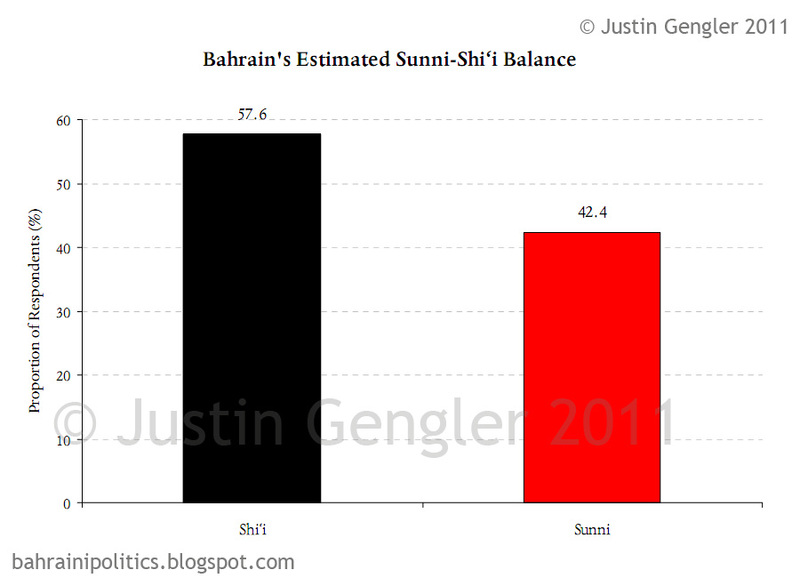 Bahraini Shi'is comprised 58% of my survey sample, Sunnis 42%--a ratio far different from that commonly cited. (Note that these categories do not differentiate between Arab and Persian Shi'a, Hawala, tribal vs. non-tribal Sunnis, and so on.) The estimated standard error is 0.238, or about 2.4%. So, the 95% confidence interval for the estimate of the Sunni proportion is approximately 37.7% to 47.0%, or 42.4% ± 1.96 * 2.4%. Correspondingly, the 95% confidence interval for the Shi'a proportion would be 57.6 ± 1.96 * 2.4%, or between 52.9% and 62.3%." You calculate the standard error and error of the 500-household sample, I have no problems with these (although I cannot re-check them without your data). But you then state that "The estimated standard error is 0.238, or about 2.4%." As far as I know, standard error does not mean anything as a percentage (what are you saying, 2.4% ?!?!?!? Even then, not 20.4% ?!). In addition, this standard error needs to be corrected to correspond to the population, because 500 sample households is much less than the actual number of households (or estimated total households) in Bahrain. I would be interested in your results after performing these corrections. I am quite certain that your calculations have a larger margin of error than you suggest. But in the end, data can never tell us too much. Your result is very close to the others listed. Of course, there are also migrants and expatriates living in Bahrain aside from the indigenous communities who figure into these statistics. These is also diversity between and within the communities. As I'm sure you already know given your assured tone, the 95% confidence interval for an estimate of a proportion depends only on two pieces of data, both of which I provide in the post above, namely the sample size and the observed proportion. Thus is it trivial to check the accuracy of my reported 95% confidence interval without any access to the raw data. I encourage you to do so, and to pursue additional training in social science research methodology at SOAS. Thanks for your response. My issue with the 95% confidence interval of the sample has been cleared up. Re: estimated standard error, I understand that there is a correction that is applied to account for a finite population. This may help figure the population-to-sample ratio into your estimates. Its called an FPC factor. I didn't mean to quibble with your data or the precision of your estimate, but to candidly discuss its accuracy. It seems like one thing is for sure-Shias are indeed the majority religious group of Bahrain. No one seems to dispute that. Does that make that an undisputed fact?